Team Transplant Titans consists of Hany Riad and Titus Augustine, who are transplant surgeons at Manchester Royal Infirmary. 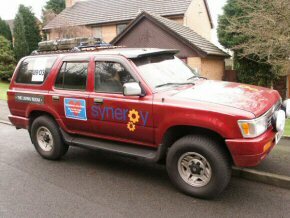 They are taking part in the 2008 Plymouth-Banjul Challenge, and left for The Gambia on 11 January 2008. For more information about Transplant Titans, please see their main web page. This page contains progress reports of their journey, sent back both by email and by text messages the Plymouth-Banjul 'Field Reports' service. Links to Google Maps are shown as [map], and [more pics] shows more photos of the area from previous challenges. The team were finally on their way, having set off in the morning from Manchester Infirmary. They were waved off to an affectionate farewell by colleagues, Sheila and Ben. At 2pm they were near Birmingham in atrocious weather, and reached Portsmouth around 6pm. After a beer with Joujou and Mark, they boarded the ferry. The Toyota was subjected to a security check. They wanted to know what the Banjul rally was. Said it would all be downhill after Portsmouth. They had a meal on board, and went to bed during a rough crossing in strong winds. They disembarked at 7am and drove south via Bordeaux in great sunny weather with the smell of Cuban tobacco, as Hany was puffing the pipe while driving. They crossed into Spain around 3pm about 40 miles west of Lourdes. 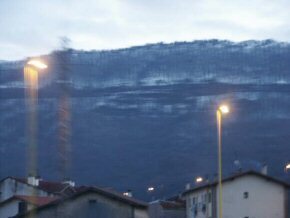 They crossed the majestic snow capped Pyrenees, and were hoping to get to Madrid that night. 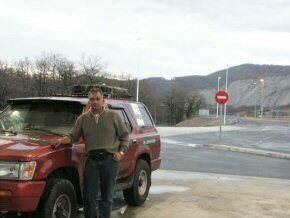 However, after a long day of driving they decided to stop at a hotel in Burgos [map] in Northern Spain. 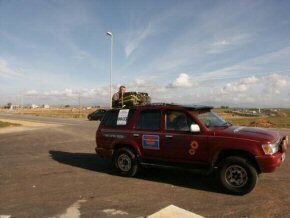 They set off early, crossed Madrid by mid-morning, passing Cordoba, Granada and Malaga and then along the coast road to reach Tarifa [map] at 7pm. The mileage to Tarifa from Manchesterso 1400 miles. The car has behaved itself beautifully, except that it is a bit thirsty on fuel. 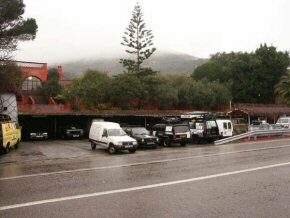 The Hotel Meson de Sancho is situated 9km from Tarifa, and is the unofficial starting point for the rally and where the teams meet. An interesting sight met the Transplant Titans on turning into the hotel, with several bangers all ready for the rally parked in front. After checking in, they met the other teams and had dinner. Monday is a rest day for teams do their final checks and preparations before crossing to Africa. The day started off miserable with rain and fog after a whole night of torrential rain, but it cleared by late morning. 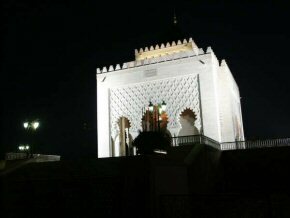 The team did their preparations, filled up with oil, and booked tickets to Tangiers. 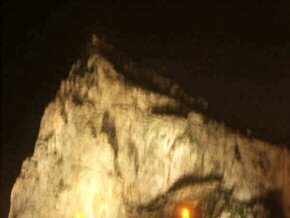 In the evening they went to Gibraltar but could only make it after sunset. They returned and had a meal with the rest of the teams. 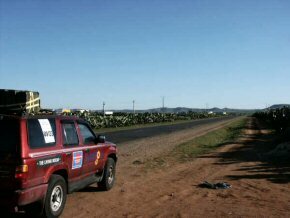 The teams decided to group up for the stretch through Morocco, heading for Rabat before deciding on the route through the Atlas mountains. 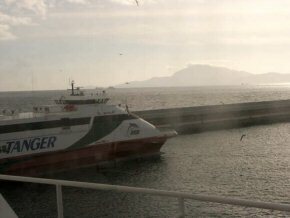 Transplant Titans arrived at Tangier after a 45 min jetfoil crossing, together with about six other teams. 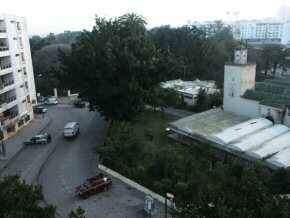 They reached Rabat [map] at 5pm. Hany's cousin and her husband took them for a drive around the city and they then checked in to a hotel with about 13 other teams. 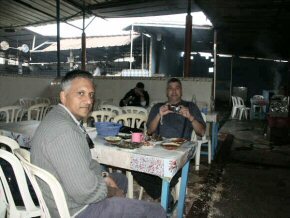 They went out together for a meal in the Medina quarter of the city. 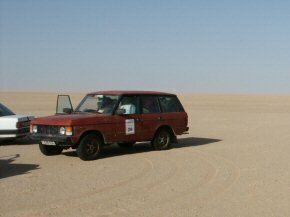 Different teams decided on different routes depending on their vehicles and preferences, with a plan to all meet up in Dakhla before the Mauritania stretch. Transplant Titans left their decision until the morning, to take into account whether there might be snow in some of the mountain passes. 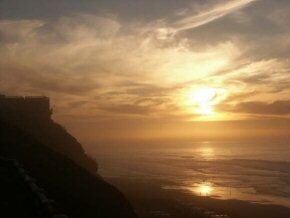 From Rabat, they headed along the coast, in warm sunny weather, stopping for a break in the pleasant town of El Jadida [map]. 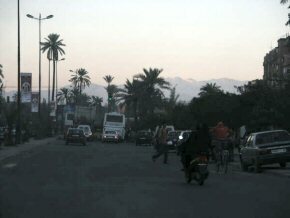 They had a good drive into Marrakech [map] [more pics] with the spectacular backdrop of the Atlas range, but they almost ran out of petrol. 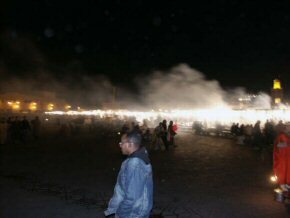 Marrakech is an intense blast the senses and driving absolutely chaotic. The central square is unique. 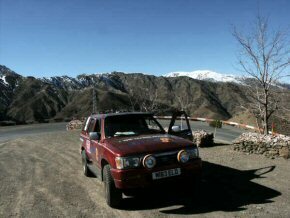 They left Marrakech using a different route to the other teams, with a longer drive through the Atlas Mountains. 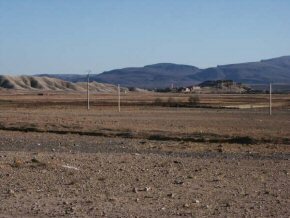 The landscape was barren and dry, with many villages and snow tipped peaks as a backdrop. 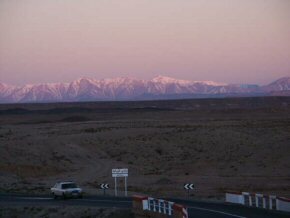 They stopped in a Berber village for a break, and then crossed the Tizi-n-Tichka pass [map] to reach Ouarzazate [map]. They had a good drive, as most of the snow had melted except for some on the hillsides. Once on the Sahara side of the Atlas, it began to look like desert, with dry reddish dunes and rock formations. Ouarzazate is an interesting town. 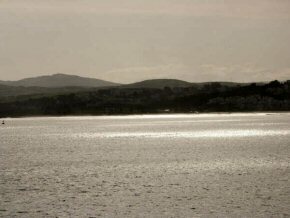 It is set in the middle of nowhere but has a thriving film industry. 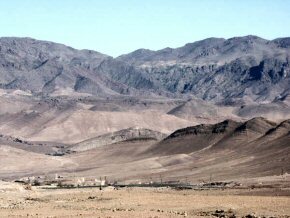 Because of its surroundings, a lot of movies which involve desert and barren scenery are shot there. 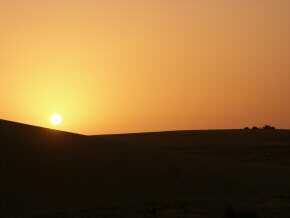 The BBC was currently shooting bible stories there, and Gladiator was shot in a village called Ait-Benhaddou close by. 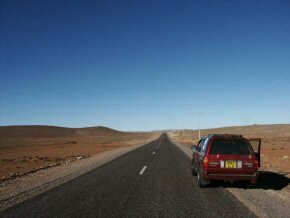 The mileage to Ouarzazate touched 2004. They reported that they were growing fond of the beast and there had been no hitches so far. They left Ouarzazate before 7am on a crisp cold morning, with a clear cloudless sky, brilliant sunshine and the shadows of hills against a backdrop of snow capped mountains. Real rural Morocco. 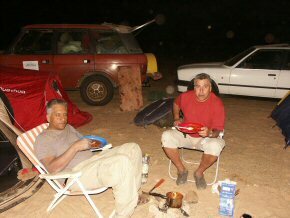 They had an absolute marathon drive through a changing landscape and scenery via Tazenakh, Taroudant, Agadir, Tiznit and then the beautiful costal road to Sidi Ifni [map] for an overnight stay near the ocean. 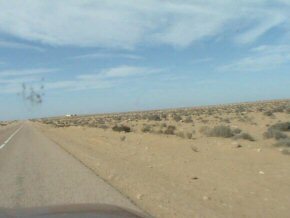 The weather was fine, there were no hitches and they had their first sighting of real desert as they made the long drive along the coast from Sidi Ifni to Laayoune [map] in Western Sahara. 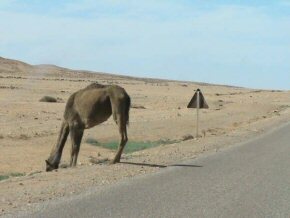 They drove into Tarfaya hoping to take a break, but it was literally deserted and unappealing, so they carried on. Interestingly the Canary Islands are only about 60 miles away from Tarfaya in the Atlantic Ocean. Laayoune is a military town, full of UN personnel and vehicles. 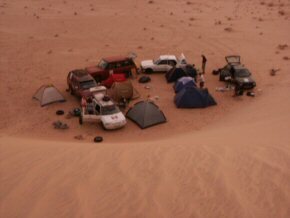 There were several teams staying in different hotels, so there will be a big group going on to Dakhla on Sunday. 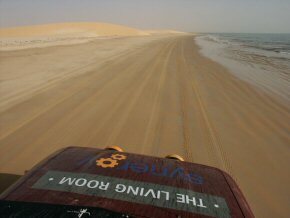 They reached Dakhla [map] [more pics] tired but OK, after driving through a sandstorm all along the way. 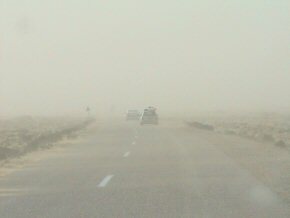 It was a hazy day with a strong wind gusting sand across road. Transplant Titans are spending the day at the campsite with several other teams. Mobile phone reception is poor, and they are not able to send us any pictures. 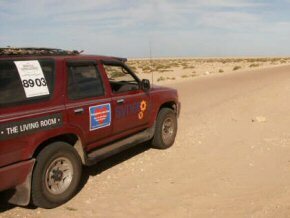 However, they have a satellite phone, which will allow essential communications through the desert, where mobile phones tend not to work at all. 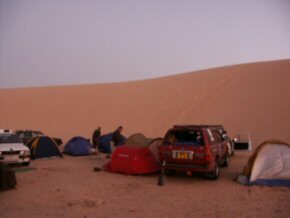 They left Dahkla in a group of five cars with a guide, heading for the Mauritania border. 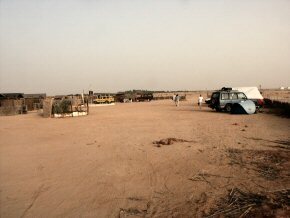 They plan to stay overnight in Nouadhibou [map] [more pics]. They were unable to send further news for three days as mobile phones didn't work. Field Reports posted by other teams talk about a huge sandstorm and chaos at the border. A five hour wait is not unusual! 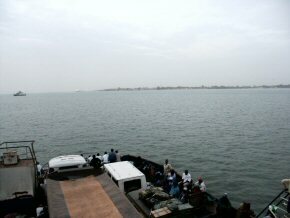 These photos were sent after they reached Banjul. 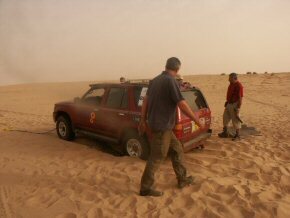 Transplant Titans crossed the Senegal border after three memorable, enjoyable and surreal days in the Mauritanian Sahara. They are well, but dirty, dusty and tired. They reached Zebrabar [map] [more pics] at 10pm after getting separated from the group. They have done 3700 miles so far. Saturday is a welcome rest day at Zebrabar. 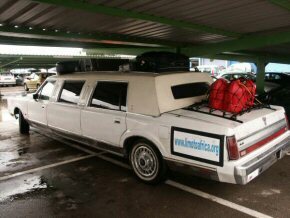 They have cleaned and repacked the car ready for the final run to Banjul tomorrow. The end of the Challenge is in sight. They anticipate their only problems now will be bureaucracy and corruption at the border crossing. 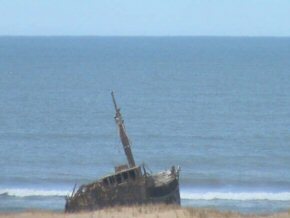 They couldn't connect to the internet to send any news or pictures at the time, so these updates were based on Plymouth-Banjul website. They missed the last ferry from Barra across the Gambia River on Sunday night, as it was too full, so they slept in the car and caught the first ferry on Monday morning. 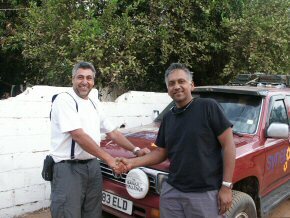 They arrived in Banjul at 9.15am local time with no problems and a total mileage of 3996 miles. They are now taking a well earned rest, but will be visiting Kings Kid Academy very soon. 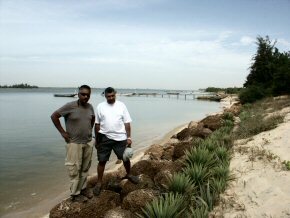 Titus and Hany would like to express their gratitude to all who have helped, supported, prayed and encouraged. 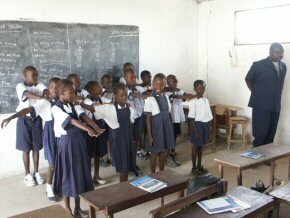 Firstly they went to see a child in a school with a medical problem. 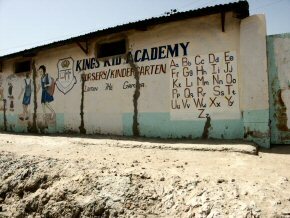 After that they went to another school in Siffoe which Pageant helps. 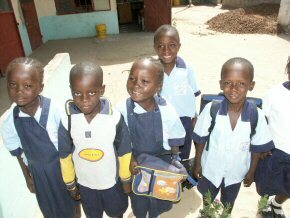 Wandifa, the Pageant agent, then took them on a drive through rural Gambia. In the evening they were invited to a Rotary club meeting in Banjul, On Thursday there is a procession of the rally cars in Banjul. Hany and Titus are hoping to return to Manchester on Friday.